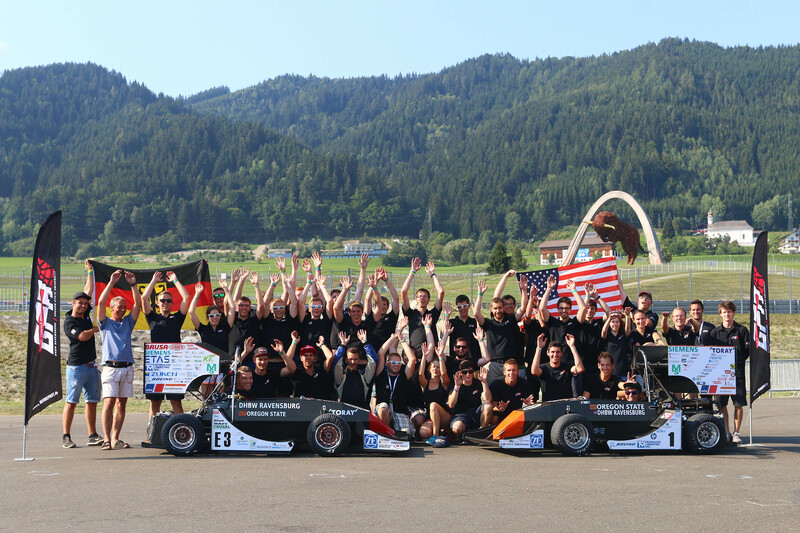 Only one week after a very successful Formula Student Germany, Formula Student Austria (FSA) began and ran from August 10th to the 13th at the Red Bull Ring in Spielberg, Austria. While 110 teams participated at Formula Student Germany in Hockenheim, FSA was considerably smaller with only 40 teams (split between the electric and combustion classes). 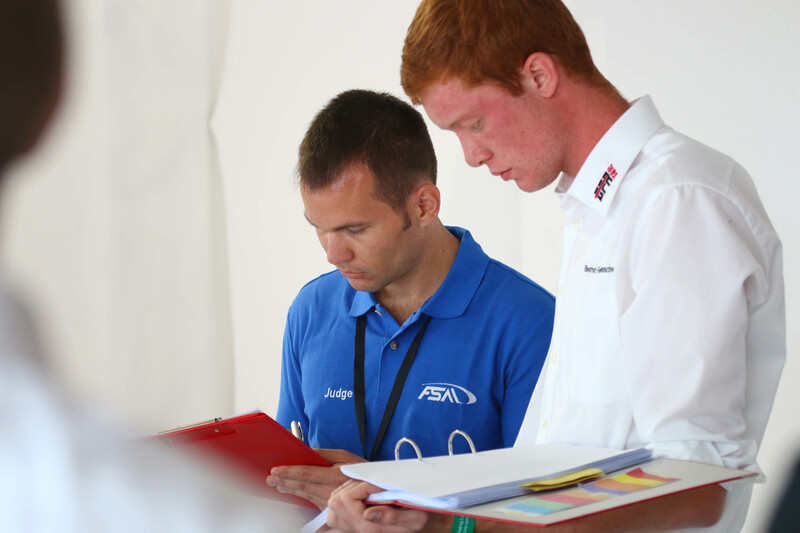 Although FSA was a smaller event, many of the top teams from FSG were present, making FSA one of the most difficult competitions of the season. By the end of Formula Student Austria, both the GFR electric and combustion vehicles were on their respective podiums. The combustion car gained its third overall victory of the season and the electric car took home an overall third place. The double podium finish at FSA was a very satisfactory conclusion of the 2015 season and a historic moment for Global Formula Racing! Just one day before the official start of the competition, the entire team departed Friedrichshafen, Germany and headed to Spielberg, Austria. After a 7 hour drive, we arrived and set up our tents in sight of the Red Bull Ring. With beautiful mountain scenery and warm summer temperatures, the team let the evening end comfortably and prepared for the next few days of intense competition. In contrast to the competition at the Hockenheimring, the pits at FSA have to be set up in the morning, prior to the technical inspection later the same day. Once both cars and pit equipment were unloaded, both vehicles continued directly to technical inspection. As there was no queue, the cCar and the eCar both started scrutineering immediately. The eCar was the first car at competition completely through tech, with the cCar following shortly after. In the evening, the organizers welcomed all teams. In addition, there was a photo with all vehicles and team members. The second day of FSA was packed with static events. Design, Cost, and the Business Presentation all occurred on the same day. Both the eCar and cCar design events started first thing in the morning with cost events following directly afterwards to eliminate any unfair advantage. The decision to have the design events at the same time was specific to only Formula Student Austria and although it caused a logistical issue, the team was able to mitigate any problems with proper preparation. First of the static events, design allows the teams to defend the technological concepts and engineering effort in both vehicles against expert opinion. Immediately after design began cost, in which the cost awareness of the team was tested and applied to a specific case study. Despite the early hour, the team was able to complete both static events well! After a relaxing morning in the summer heat, a small part of the team had to face the third static event, the business presentation, a hypothetical business pitch based around each vehicle and team. Following the business presentation, both vehicles were driven on the test track and final adjustments were made for the dynamic events the next day. Overall, the Global Formula Racing Team was able to do well in all of the static events. The cCar presentation team managed to qualify for the final round of presentations on Wednesday. On the morning of the third day, the Acceleration and Skidpad events took place. Only a narrow time span of less than four hours was available to complete both events. GFR did well in both events, and one of our drivers achieved the best combustion Skidpad time. The afternoon was busy with AutoCross (Auto-X), which serves as qualifying for the most important dynamic discipline of the final day (Endurance). Two drivers are each given two attempts and the best time of 4 laps is taken. In the evening the whole team listened to the public presentation of the top business plans. Our presenters would score a 3rd place with their performance. 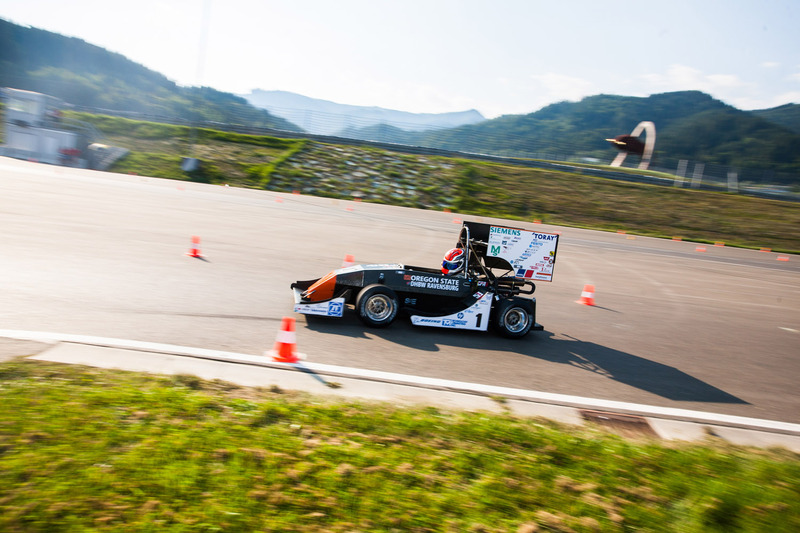 On the final day of Formula Student Austria, the last and most important event took place, Endurance. It is a 22 kilometer long race and the winning team gains 325 of the overall 1000 points. The fastest times in the Auto-X dictate the starting order: slower teams start in the morning and the top 3 of both combustion and electric vehicles start last in the afternoon. With two very good Auto-X lap times for our two cars, we started in the afternoon. The electric car narrowly missed a place in the top 3, while the cCar was fastest, with the teams from Stuttgart and Graz University of Technology very close behind. In Endurance, it is not only important to drive fast, but to be consistent with the fast times over the total distance of 22km. Many vehicles do not even finish the event due to technical problems. Therefore, the Endurance remains exciting until the end, and produces great joy and cheering from the teams when their car crosses the finish line. As the afternoon settled, the first Global Formula Racing car, the eCar, went out on the track. The temperature was around 35°C. High temperatures usually challenge the cooling systems of the vehicle battery, but nevertheless, both drivers of GFR15e mastered the course and established solid lap times. Immediately afterwards, the Top 3 combustion vehicles went out on track: RennTeam Stuttgart, TU Graz, and GFR. In the first half of Endurance, both competitors were able to provide extremely good lap times and the cars were evenly matched. The excitement continued into the driver change. As all three vehicles pitted to undergo the change, a very loud bang was heard from the stands. There was great confusion in the stands as all teams feared for their cars. The FSA commentator finally announced that there had been a failure during the restart of the Stuttgart car. A continuation of the race was therefore unfortunately impossible for them. The second half of the Top 3 continued only with two vehicles. The Global Formula Racing Team was able to demonstrate consistent lap times while the vehicle from TU Graz, in the last two rounds, had problems with the fuel pump and therefore slowed. Following combustion endurance, the top 3 of the electric vehicles went out: the Green Team Stuttgart, the Academic Motorsports Club Zurich, as well as the team of TU Delft. All vehicles showed excellent lap times. Unfortunately our friends from the TU Delft were not able to finish the Endurance due to high battery temperatures. Till the final moment when the driver of the vehicle left the track, all GFR members kept their fingers crossed that Delft could start the vehicle again. We are delighted to keep the FSA rankings from last season. We also want to congratulate all the other teams on their achievements! Following the award ceremony we shared in celebration with other teams and celebrated our victories, bringing an end to another successful GFR season. We would like to thank all of our sponsors and supporters! Without your help we would not have been able to realize this seasons achievements!